After sixteen or so movies, the Marvel Cinematic Universe can start to feel a bit redundant. But after a fresh new take on Spider-Man: Homecoming earlier this summer, Marvel can add another gem of a film to their lineup from this year alone because Thor: Ragnarok is charming, funny, visually impressive and boasts one of the more memorable villains of the MCU to date. It’s been two years since the events of Avengers: Age of Ultron and Thor (Chris Hemsworth) has been off adventuring through the realms when he hears that Ragnarok, what is essentially the end of days for Asgard, is prophesied to happen. After making his way back to Asgard, he’s disturbed to find his brother Loki (Tom Hiddleston) has tricked the Asgardians into thinking he is Oden, whom he’s banished to Earth. Once there, they quickly realize that Oden is dying and thus can no longer fight off the Goddess of Death–also known as Hela (Cate Blanchett), Oden’s first-born. All-powerful Hela, full of disdain for her father and brothers, takes over Asgard and sends Thor and Loki to another planet. 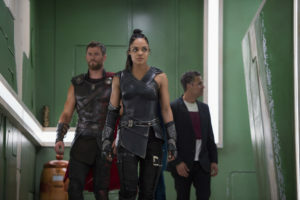 Forced into a gladiator-like arena after being captured by Valkyrie (Tessa Thompson) and forced to fight The Hulk (Mark Ruffalo), Thor must assemble his own team (hilariously called The Revengers) to join him in his fight against Hela and the quest to take back Asgard. As Marvel continues to expand, it’s prudent to note that director Taika Waititi is an incredibly smart choice to helm this film. Some of his directing choices are distinct and visually appealing; the cinematography is full of color and a vibrancy that gives the film a lot of visual energy, which in turn balances the character’s theatrical enthusiasm. Even more than that, the film is refreshing and fun. It carries with it a light-hearted tone, but one where the stakes aren’t forgotten amid the comedy. An example of this is how the film decides to deal with Hela. 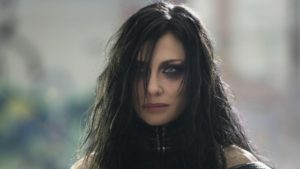 One of the rarely strong villains of the MCU, she has more than one dimension even while her handling of the situation is obviously violent. It’s hard not to understand her sense of betrayal after having been put away by her own father and replaced by brothers she believes to be lesser than her. Still, her all-consuming power and need to destroy make her for a lethal and worthy adversary. It’s ironic that a new sibling arises while Loki, who arguably loves to destroy just as much, attempts to help Thor. He’s graduated from power hungry to a joke of a villain in many ways and, while I enjoy his interactions with Thor, it’s hard to understand the need to continue having him around besides him obviously being a fan favorite. The indecision of his actions is often confusing and it’s hard to justify loving or hating him when he himself is caught in limbo. The first Thor is fun for multiple reasons, one being the fact that Thor didn’t know human customs and the film played this up for comedic purposes. 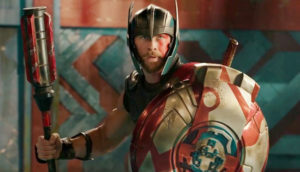 The second film lost a bit of its edge in its darkness, something which didn’t fit the style of the way Thor was initially presented. Thankfully, Thor: Ragnarok managed to give Thor more proper character development, enhance his power, and banked on Chris Hemsworth’s comedic timing. Thor is a bit of a ridiculous hero, but one with immense power even he has yet to tap into. This film doesn’t shy away from these things and allows for Thor to fully realize his own place in Asgard and also allows him to live up to his name and power. While Cate Blanchett is obviously a highlight of the film (the actress is equally menacing and full of personality–her ability to pull half an eyeroll at everyone is commendable), it’s Tessa Thompson’s addition which makes just as much of a splash. Valkyrie comes with baggage and an attitude, but underneath all of the bravado is a lot of pain and the need to forget her past. Both she and Hela have zero patience for the stupidity and constant nonsense of the events and people around them, but they both fight for very different reasons and this separates the two. Interestingly, while many have balked and fawned over Thor and his attractiveness, it’s amusing to see that no matter how hard he tries, Valkyrie is not swayed by his attempts at persuasive charm, even while he pleads for her help. Other new additions to the cast, including Jeff Goldblum as Grandmaster, are wonderful and truly do wonders with building even more worlds and elements beyond what we’ve already seen within the MCU. There are certain instances when not all of the jokes land and it becomes a bit too over-the-top. However, it’s never detrimental to the film. It also lags just a bit around the middle and Thor spends a bit too much time on Grandmaster’s planet, but it’s a minor quibble in the grand scheme of things. One of the more unfortunate aspects, however, is the loss of Jane Foster (Natalie Portman), who didn’t reprise her role for Thor: Ragnarok. Since 99% of the film is set on alien planets, it would have been hard to incorporate her into the film, but I consider her character a loss because it took away the romantic aspect; the MCU already struggles with making romances work, so taking one away is a bit of a downer. 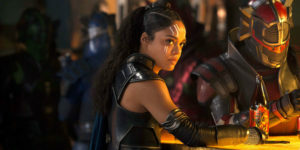 It isn’t overtly clear whether or not Thor and Valkyrie will eventually have some sort of brief romance, but for now, at least, the film functions well enough without one. As the MCU begins moving into its next batch of films, it’s safe to say that Thor: Ragnarok is among its best. It’s still very much a Marvel film, but it feels fresh, light, fun and builds worlds and characters fairly well. There’s also a heightened energy, with colorful visuals and action sequences that pop onscreen (3D is actually worth it for this film). Thor is at his most powerful and it’s a sight to behold; Hemsworth is delightful and more memorable as a funnier version of Thor. All this to say that Thor: Ragnarok is a very strong addition to the MCU and entertaining all the way through. Thor: Ragnarok is charming, funny, visually impressive and boasts one of the more memorable villains of the MCU to date.